If you don’t warm up or stretch, you aren’t optimizing your performance. Bill Starr explains. Getting considerably stronger and staying that way is largely a matter of taking care of the details, such as training consistently, designing a program that fits your individual needs, eating wholesome foods, taking nutritional supplements, getting plenty of rest and so forth. Most serious strength athletes take care of these tasks diligently, yet at the same time they’re negligent when it comes to two other disciplines that are most important to success in the weight room: warming up and stretching. I’ve watched athletes in a wide range of sports spend 20 minutes or more stretching out their muscles and doing various drills to warm up their bodies before a practice session or game. But when they walked into the weight room, they started lifting without doing anything to prepare themselves for the stress of moving heavy poundages in a wide range of exercises. And when they finished their sessions, they never bothered to stretch out those fatigued muscles. Rather, they picked up their gym bags and left. Sound familiar? It should, because it happens in nearly every fitness facility in the country on a daily basis. 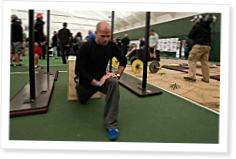 Bill Starr breaks down one of the most difficult athletic movements you’ll ever perform. Put the pieces together to master the world’s fastest lift. Anybody know where to get the tshirt on Page 9? Totally agree with this. I am following mainsite and training on the Olympic lifting team at my school in the evenings. So 3 days a week I'll have double days with CF and O-lifting (the o-lifting workouts are more than 2 hours of heavy snatches, C&J's, pulls, and squats) and the other days I just have CF. Although it should be stated I always take full days off thursday and sunday (I just shift the mainsite workouts to meet my needs). I've been doing a solid 15-20 min warmup routine since starting CF and about half a year ago started doing about half an hour of stretching post workout. I do this for CF and O-lifting. Some guys on the team are surprised at my flexibility and capacity to be able to work this much and not get overtrained and I totally attribute that to my warmups and stretches (read: crossfit. I wouldn't be where I am if it wasn't for CF and it's amazing resources). It's kept me limber (I've skipped huge steps in the o-lifting process because I was flexible enough to do the full lifts right when I started) and staved off a lot of potential overuse injuries. Even though Bill says ballistic stretching may be bad I always include it. I just do it after getting fully warmed up and right before the workout and that keeps it from being harmful. Also check out dynamic flexibility info. I've found that to be really helpful in warming up as well. For those really wanting to find good stuff on flexibility check out Kstars mobility blog at mobilitywod.blogspot.com. I've been following since he started it and have improved in every area of flexibility and this new range has brought me into PR's in every testable area. This cannot be overstated. Thanks Bill. It blows my mind how some athletes I've seen come straight into the box and get right into the WOD. I'll never understand how they can do this. I do a solid 15-20 minutes of warm-up followed by Linear Strength and then begin the WOD. I am guilty of not cooling down properly but have recently started incorporating it into my daily routines. I also take one day a week, for just pure stretching and on top of the stretching I do in my daily routines. Bill, you mentioned doing 202 situps as part of the first phase of the warm-up, but would you still do these if you were doing a WOD that had a lot of strict core movements. Say the WOD was Barbara would you still include them in the warm-up? Absolutely agree. I started MMA training and felt that I was not working the strength end of it so I started CrossFit. I injured myself and could not continue with MMA training but was still able to CrossFit so I continued but after some time, left out the stretching. Before, I was able to complete and hold a split, now I can't even get myself down into position. This is something I needed to read, Thanks for the reminder. I don't think most athletes neglect warm-ups and stretching because we're LAZY... but rather we're pressed for time, and IMPATIENT. Agree with Troys comment. Don't think many CrossFitters could be described as lazy. Also, Leg Extensions, Hammy Curls and Lateral Raises as a warm up? Wouldn't find that at my box. Functional warm ups all the way......CF Warm Up / Gymnastics Warm Up (see articles which explain these) or something similar. Also, I've seen loads of our top athletes at the games or in other comps using dynamic stretching to prep themselves for workouts, you just have to warm up thoroughly first and know how slowly to build the range. Still, a useful reminder to those who have neglected stretching. In fully be prepared for the unknown and unknowable, I think it's good to try the occasional workout with no warmup. I wouldn't try it if you are new, or uncomfortable with a certain movement. But, there is something special about going zero to 100 as fast as possible. All the fitness and self-defense training in the world won't help you, if you can only run away from or fight off someone with a proper warm-up. I also wouldn't try to go for 1rm max deadlift cold, but there was some video about Rob Orlando saying he at one point was doing heavy bench press as he rolled out of bed. I suggest a workout more like half-Cindy or Fran as a good one. Also, #4 Nick is absolutely right.